WHAT ✅You’ll receive a package of 100 12”x12” pieces of Cushion Foam Sheets. ✅The sheets are precut, and does not require pulling apart like traditional perforated packages. ✅Each foam sheet is made out of Expanded Polyethylene (EPE) foam. ✅EPE technology allows a memory foam-like integrity that gives the ability to conform and reform. WHERE ✅Storage. Fine China plates, unused kitchenware, Christmas ornaments, holiday decorations, small appliances, electronics, picture frames and etc. ✅Moving. Wrap about furniture edges, to protect from scratching and chipping. Wrap up anything for cushion safe moving. Will keep integrity of the item, and dust free. ✅Origami. Have at it! Let your imagination lead the way. HOW ✅Cradle the object of your choice, and conform to shape. Sometimes, depending on the shape of the object, tape may assist. ✅Depending on how big the item is, multiple sheets may be used. ✅For flatter items that can stack, placing a sheet in between may be enough. WHY ✅Provides stability as items are moved from one location to another, especially when inside a box. ✅Provides cushion for the potential banging against walls and other items. ✅Provides a dust free environment. ✅Provides an organized, neat, and protective state. ABOUT US ✅✅✅No matter what, we are consumers first and will always keep the consumers' mindset. Your satisfaction is #1 to us. If for whatever reason you are not satisfied, please contact and let us know. We promise to make it better. ⚡VALUE PACK - Pack of 100 count 12"x12" cushion foam sheets. Each sheet is made out of polyethylene foams. The sheets are PRE-CUT, avoiding the hassle of ripping perforated variations. ⚡EASY USAGE - Expanded polyethylene has a memory foam nature that is easily manipulated into desired shape. Therefore, the cushion foam sheets will easily conform to all edges and corners of desired wrap. In most cases, cushion foam sheets can be reused if under reasonable previous usage. 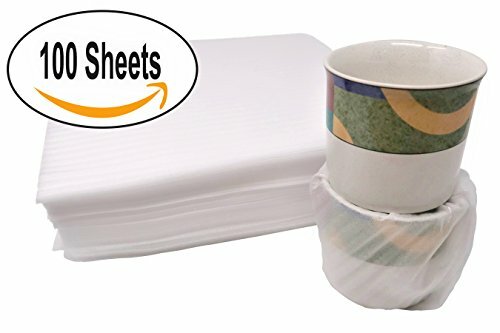 ⚡MULTI-PURPOSE - Use for PROTECTION of DELICATE and FRAGILE items such as: dishes, glasses, collectibles, kitchenware, etc. Use for STORAGE of any items ranging from small appliances to electronics that needs to be kept in same form and dust free. Perfect for moving as you can wrap table corners, chair legs, and furniture edges to prevent scratches and damage. SHIPPING items? Wrap it first. ⚡CONVENIENT - The Cushion Foam Sheets are low density. They are extremely light, yet strong. The foam sheets can be stored away easily in any area as they are space efficient. ⚡ECO-FRIENDLY - It is very important that the environment is protected. Our foam sheets are tested for 24 chemical compounds, and successfully tested negative for all 100%. RECYCLE. REDUCE. REUSE. If you have any questions about this product by GoJT, contact us by completing and submitting the form below. If you are looking for a specif part number, please include it with your message.